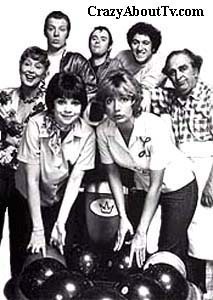 The Laverne and Shirley TV show was a 30 minute comedy series on ABC about two single females living in Milwaukee, Wisconsin in the late 1950's. (Early 1960's in Los Angeles, California starting in the 6th season). The series followed their lives as they worked hard during the day at a brewery and worked hard at night seeking romance and rarely finding any (although Shirley did eventually meet a Doctor and married him). A variety of goofy characters keep the series interesting. Title: "Making our Dreams Come True"
Written By: "Norman Gimbel and Charles Fox"
Read us any rule, we'll break it. Thank you for visiting our Laverne And Shirley TV show page!